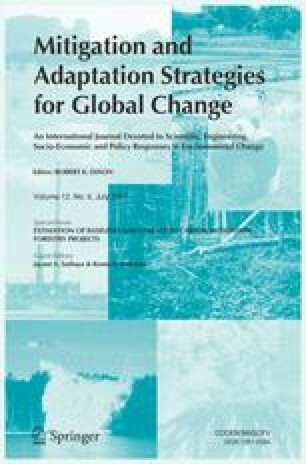 There is a need to assess climate change mitigation opportunities in forest sector in India in the context of methodological issues such as additionality, permanence, leakage and baseline development in formulating forestry mitigation projects. A case study of forestry mitigation project in semi-arid community grazing lands and farmlands in Kolar district of Karnataka, was undertaken with regard to baseline and project scenario development, estimation of carbon stock change in the project, leakage estimation and assessment of cost-effectiveness of mitigation projects. Further, the transaction costs to develop project, and environmental and socio-economic impact of mitigation project was assessed. The study shows the feasibility of establishing baselines and project C-stock changes. Since the area has low or insignificant biomass, leakage is not an issue. The overall mitigation potential in Kolar for a total area of 14,000 ha under various mitigation options is 278,380 t C at a rate of 20 t C/ha for the period 2005–2035, which is approximately 0.67 t C/ha/year inclusive of harvest regimes under short rotation and long rotation mitigation options. The transaction cost for baseline establishment is less than a rupee/t C and for project scenario development is about Rs. 1.5–3.75/t C. The project enhances biodiversity and the socio-economic impact is also significant. This work was supported by the U.S. Environmental Protection Agency, Office of Atmospheric Programs through the U.S. Department of Energy under Contract No. DE-AC02-05CH11231. Disclaimer: The views and opinions of the authors herein do not necessarily state or reflect those of the United States Government or the Environmental Protection Agency. We thank Jayant Sathaye and Ken Andrasko for their contribution at various stages of development of this study. We also thank Neeta Hooda, Mohit Gera and all other scientists of ICFRE for their suggestions. We thank the Karnataka Forest Department, particularly Swaminath M.H., Rangaswamy, Nagaraj and several Range Forest Officers of Kolar. This project was conducted under a collaborative programme of USEPA-Ministry of Environment and Forests.